← Customer Service ICICI Bank. Piku, Motion se hi Emotion! 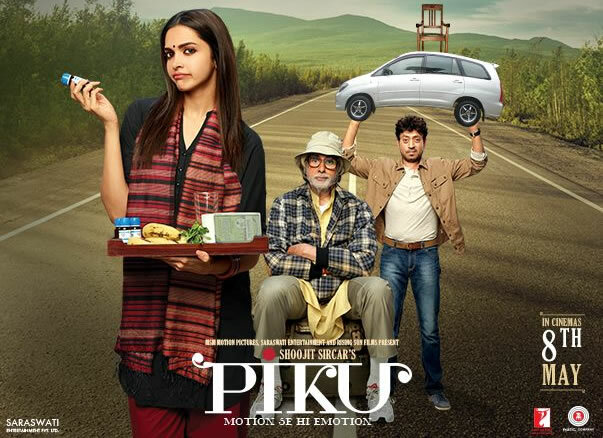 Take three incredibly talented actors under the direction of another incredibly talented director and combine it with a very believable modern story and you have a block buster Piku. All the reviews that I had read about the film had been positive but despite wanting to see it from the very first week after it was released a month ago, I was unable to because of my illness and vacation. I finally made it yesterday and what an experience it was. I have seen other old men with constipation going through life in exactly the same way that the old man in this film does and the reality was simply stunning. That an Indian producer can take such an unmentionable theme, yes the leitmotif to make it mentionable, is constipation, and make such a film with such a team of talented people is simply too valuable an experience not to be shared with my readers. Most of my readers from India must have already seen it by now and if they have not they must immediately see it before it is taken off the theaters. Seeing it in the small format will not be the same experience. To my overseas readers, I will recommend this movie with a [rating=6] rating and would urge you to see it with English subtitles in whatever format that you can. Some of the nuances of the Hindi and Bengali language will be missed but the overall impact is unlikely to be affected. 6 Responses to Piku, Motion se hi Emotion! Could agree with you more. It’s one of the finest and simplest movies that I have seen in along time now. It seemed pretty much like a “family affair” as there have been several in an around us. Apart from the theme “Motions sey Emotions” the openness, the feelings of the individual characters has been very nicely projected. I saw this in Delhi in the first week itself, and enjoyed every moment of it. BTW, am not sure if you get to see Tamiz Films in Pune. If you can you should see 36 Vaithinile, a movie in which Jyothika makes a come back. Another nice movie. This particular one does not seem to be running here and my efforts to get a DVD failed. Perhaps after a while it will be available. You have a distinct advantage over me with your fluency in English – something is lost when you must read subtitles and dubbed movies are most often so poorly done to me they are unwatchable. shackman recently posted..Internationally Famous Landmarks In My Hometown. Yes, but I suspect that for this one, the English subtitles should pose no problems as quite a bit of the dialogues are in English! Again, I’m glad you had a great time. I’ve added it to my Netflix queue, but it will probably be a long time, if ever, that it is available. You may be in for a surprise.